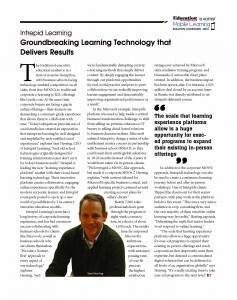 Intrepid Learning was named one of the Top 10 Hottest Mobile Learning Solution Companies for 2016 by Education Technology Insights magazine, a testament to Intrepid's success in partnering with executive education programs to deliver corporate learning in a learner-first, mobile-first fashion. The traditional executive education market is in a state of massive disruption, with business schools facing technology-enabled competition on all sides, from free MOOCs to traditional corporate e-learning to B2C offerings like Lynda.com [...] and Intrepid is uniquely poised to open up a new world of possibilities for 21st century executive education models. Click the image below to read the full article, and for more on Intrepid's executive education partnerships, see our Executive Education page.